The final Friday at the range turned up chilly. Equipped with shooting jackets and eye-patches, Platoon 373 moved to the targets for the final time. The atmosphere approached a holiday. This was Record Day. The DIs wanted everyone to qualify. The marksmanship instructor had issued each man a score book. Reviewing that after half a century, I cannot make out exactly what I shot on Record Day. After recording all hits and misses during the final week, I only wrote down fragmentary scores for the last day. Maybe that was because there was a scorekeeper for each rifle station. All I can make out is that I was shooting pretty well. I walked back to the 500-yard line needing only 15 or 20 points (out of a possible 50) to qualify. I do remember having a cheering section. One of our DIs – I think my mentor Corporal Eastman — sat behind me and watched. So did some other recruits. At 500 yards, the target is tiny. The bulls-eye is 20 inches in diameter. To this day, I can feel the rifle recoil against my shoulder and recall my surprise with each round. I vaguely recall watching the target crews waving the bull’s-eye disk. My memory claims I dropped the first shot in the inner ring and then fired nine straight bulls-eyes. That would total 49 points. But the marks in my score book suggest only seven bulls-eyes. Either way, it was the best shooting I ever achieved. Corporal Eastman congratulated me – something I had never experienced from a DI. I managed a final score of 220 points out of 250, which earned me the badge of a Rifle Expert by one point. As I recall, only eight recruits from the platoon shot expert. My bunkmate, Private Gary L. Marshall, from Carrizo Springs, Texas, was the high man in the platoon with a final score of 236 points. What a performance. Record Day was when I understood boot camp. They were not just hazing us as though we were joining some college fraternity. The system was changing us into professional soldiers. 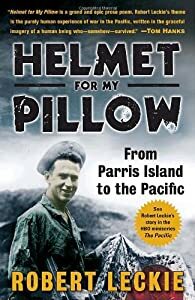 Helmet for my Pillow: From Parris Island to the Pacific, p. 30 (1957; Bantam ed. 2010). If I am hazy about my shooting on Record Day, I was flat wrong in my memories about the assassination of President Kennedy. For decades I told people I was pulling targets in the butts at Camp Matthews on November 22, 1963, the day of the assassination. But the score book shows Record Day took place Friday, November 8, two weeks before the assassination. On November 22, we had returned to the Recruit Depot. At some point, the duty drill instructor informed the platoon in formation of the shooting of the President. That announcement most likely took place at noon chow at the mess hall, but the false memory has crowded out the real one. After the police captured Oswald, I recall one of our drill instructors saying that the authorities believed the killer was a former Marine. He said he hoped they would turn Oswald over to the Marines for punishment. That would have been severe. The drill instructors did favor us with more information from time to time, but we had no radio, television, or newspapers that Friday or Saturday. I likely did not even read a Sunday paper. You only could buy a Sunday paper (San Diego Union or Los Angeles Times) if you declined chapel call. certainly Major General Bruno A. Hochmuth, who commanded the San Diego Recruit Depot. President Kennedy had been at the Depot earlier in the year, and the general said he had met him and helped show him through the base. No lesser officer would have escorted the President. I remember the speaker’s being stricken with grief. (A year or two later, I had the privilege of meeting General Hochmuth. He was in uniform having dinner with his father in a booth at the Western Kitchen, a popular barbecue restaurant on Richmond at Greenbriar in Houston. Two of us, although now civilians, stood at rigid attention and introduced ourselves to our former commanding general. The general told us he had grown up on West Main, two blocks away in Houston, where his father still lived. That Sunday evening, as I recall, the Depot allowed all recruits to call home. Recruits rarely made or received phone calls. Recruit Training Regiment had scheduled perhaps one or two brief calls during boot camp. We wrote and received letters only. We marched to a line of phone booths. There were perhaps five minutes to talk. I telephoned my parents in Midland. I recall my father — who had opposed President Kennedy — saying tearfully, “They killed our President.” My parents were stricken. Recruit training continued right through the state funeral. We did not watch live television. The night of the funeral, I do recall the drill instructors moving us to a Quonset hut to watch a recap of the funeral on a small set. We were among the few Americans who did not spend those four days transfixed by the death of a President.